Milestones are how we mark certain aspects of our lives that meaning. Some are meaningful and some are meaningless. A perfect example of important milestones are the ones associating with growing up. The first day of kindergarten, hitting puberty, being able to drive a car, graduating, turning 18, turning 21 – these are all things that everyone experiences and can identify with you on. Other things like starting a new job or hitting a goal weight are just as meaningful. The only thing that separates them from the standard life experiences is that not everyone can identify with them in the same way. As I get older I get obsessed with time. Contrary to what the song says – time is not on your side. Time for me these days is more about a comparison of where certain things stand within the same time frame. You would think as I approach my forties that time would be about running out or questioning my own mortality. It isn’t I look at death the same way as I did in my twenties. At some point it is going to happen, while I may change things to delay it, I’m still going to eventually die. Instead of dwelling on it, I live to enjoy my life instead of trying to stave off death. So how do I compare time? My wife and I passed an interesting benchmark in the last couple months (the exact date is in question becomes of muddling circumstances). I have been in my wife’s life longer than she has lived without me. She was eighteen when we started dating and we have now been together a little over 18 years. In about 3.5 years she will be in my life longer than I have lived without her. Having known so people that have been divorced, remarried, never married, or lacking long term relationships – I understand some people won’t be able to identify with that fact. At this point even f they stay with the one they are with now, it will still be decades longer before they can achieve that goal. This however, is still not meaningless. It is very meaningful to us. What is an example of a meaningless time observation? The fact that I was born closer to The Beatles being a performing band than my son was to being born and Nirvana being a performing band. 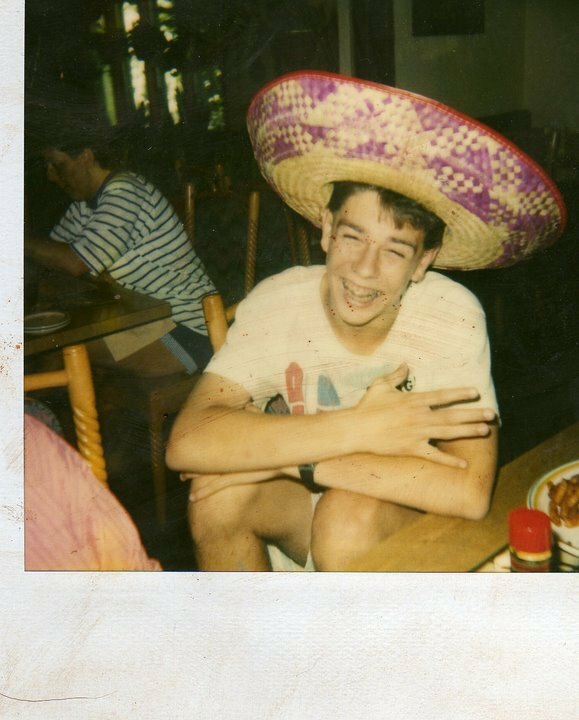 The fact that I’m the same age my father was when I was eighteen (the Polaroid at the top of the page was my eighteenth birthday dinner at Chi Chi’s). Today’s thought – in a decade I’ll be the same age as my Grandfather was when I was born. That my son has lived in the same house all of his life, but by the time I had been his age I lived in four different places. It makes me maddening sometime. The real reason these are pointless, they all making me think momentarily that I am old. I am not. I’ll even argue that with the aches and pains that body routinely goes through. I wrote in the past that my generation is the one that doesn’t grow up. We also are refusing to get old. I can hear you in your head now, he is only saying that because he is old. I offer for evidence Wilfred Brimley. Mr. Brimley was fifty-one when he was in Cocoon, I’m not going to look like that when I’m fifty-one in twelve years. In case you are wondering Steve Gutenberg was twenty-seven in the film. The whole point of the movie are a bunch of old people that are trying rediscover youth. Steve Gutenberg played the guy that thought they were cute and they were going to break a hip. I guarantee my peer group is not going to be in the retirement in our fifties. I won’t say we look young – but we look at least a decade younger than our parents did at the same age. I’m also assuming our parents look a decade younger than their parents. When we hear the stories of how Noah lived into his nine hundredth year, he really was thirty-seven and just looked nine hundred. If I was more vain I could pass for younger. I could get rid of my premature gray hair. I could shave my face. Both those things could remove five to ten years of aging. I just don’t care. It’s the thought that in twenty years we have moved from beepers being a cool new thing with a touch screen digital communication device in my pocket that is given away with service contracts. It is insane. We have the other meaningless time devices that do scare us as we get older. When I’m the same age as my grandmother passed away (fifty-six) I might be looking at my mortality at the first time. After that it will be ages where I have lived longer than someone else. This is a meaningless milestone that is unimportant. We already track the milestone of “you didn’t die yet” – we call that a birthday. We can calculate to the minute of how old we are. We could say the second, but birth records are not that precise yet. Every breath is another that is meaningless to compare to someone else’s. We are all different, so why would we think our lifetime would be of equal length or even comparable. These are the thoughts that go through my brain on a regular basis. Are these thoughts important in the grand scheme, no they are meaningless. I guess I’m stopping now, otherwise I’ll just keep rambling further and further about the passage of time. All the while I will be wasting yours.